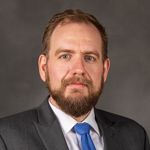 Nicholas G. Hoffman, Academic Outreach and Career Specialist for Graduate Programs for the College of Business, came to SIU from Rockford, IL. Formerly a Teaching Assistant for the College’s oMBA program, he also brings his expertise in data management, evaluation and program development to expanding the College’s career services to graduate students, providing advisement to current MBA graduate students, and overseeing the teaching assistantship experience for the online MBA program. He is currently a doctoral candidate in Applied Psychology.